Early in my leadership quest to “find a better way to lead,” I had the wonderful pleasure to work for Jan and Olga Erteszak, Polish immigrants who had fled the Nazis in Europe and then founded a ladies’ lingerie company in Los Angeles. The Olga Company was the creative leader in this industry, designing and producing fashionable lingerie, sleepwear, and loungewear. I learned so much about creativity from Jan and Olga because we literally practiced creativity in meetings. What fun as we stretched our imaginations. One memorable day, Jan, with a wink and that crooked smile of his, gave me some pamphlets to read written by Robert Greenleaf. 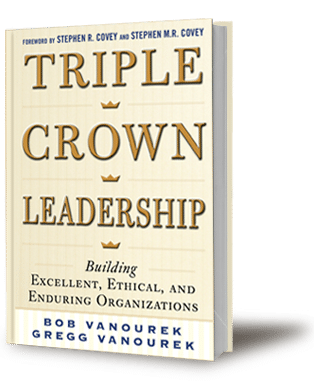 Knowing my burning interest in leadership, Jan quipped, “I think you’ll find these interesting.” The message was ages old and simple: the leader serves. The only people who can determine whether you are a leader are followers–people who follow you willingly, not people who just grudgingly comply with your edicts. Grudging compliance is fear based. Servant leadership is love based. This lightning bolt was the exact opposite of my previous leadership mindset. Leadership is a complex subject, much studied and written about, and frequently misunderstood. What I have learned, though, slowly and painfully, is that leadership involves deep connections with people, relationships with them, caring for them, and helping them get to a better place. To what degree are people willingly following you? To what degree are they just grudgingly complying? Whenever it’s grudging compliance, then they sense you are not serving them, and they will shut down the incredible contributions they could be making. Mastering the art of leadership is to understand that the leader serves.